Many pet products on the market today contain harsh chemicals and irritants that aren't safe for our pets. It's not only what our pets eat but what we are putting on them that is just as important. *This Post Contains an Affiliate link, if you click on the link and make a purchase we may receive compensation. 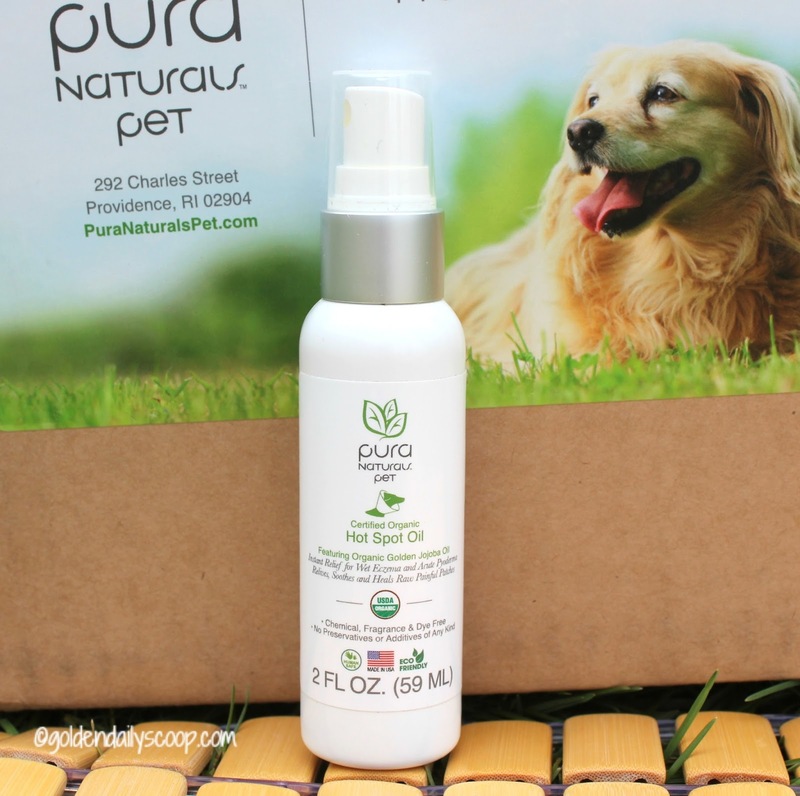 Pura Naturals Pet™ just debuted at the Global Pet Expo where they introduced their new line of earth conscious pet products which offers a variety of effective non-toxic all-natural alternatives that are safe for pets, humans and our planet. 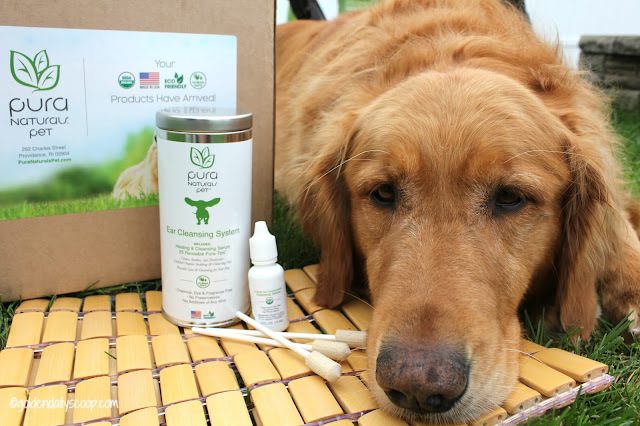 In addition to shampoos, salves and healing products, Pura Naturals Pet offers two distinct Organic Cleansing Systems for ears and teeth and we are so happy to share them with you today along with their Hot Spot Oil. My Goldens are known for ear infections so its important to keep their ears clean and dry, especially during the warm summer months. I love this ear cleansing serum because it is safe and effective with just 4 ingredients: Organic Olive Oil, Organic Witch Hazel, Organic Mullein Oil, Organic Chamomile. Directions: Apply 2 drops and massage base of ear. Wipe clean with Pura Tip applicator. Rinse applicator with warm water. What's so unique about this ear cleansing system is the Pura-Tips™, a plant based foam that is safe for your pet and the environment. This Foam is designed to be highly effective at absorbing dirt, oil, and grime. Pura-Tips™ are specifically designed to gently clean your pet’s ears without doing any damage to the inner ear or ear canal. I have never seen anything like these Pura-Tips but I have to say they work wonders on the dog's ears without leaving them red and irritated. They are soft but sturdy enough to get the job done. Best of all, they are reusable. Oral hygiene is critical for your dog's overall health that's why it's so important to clean their teeth daily if they allow you to. Instead of using a toothbrush and tooth paste, this cleansing system contains tooth salts and a Pura-Finger™ applicator. Pura Naturals Pet teeth cleaning system prevents tooth decay and promotes gum health with just three simple ingredients: Sea Salt, Sodium Bicarbonate and Peppermint Oil. Directions: Sprinkle Salts directly onto moist Pura-Finger™ Applicator. Gently cleanse both teeth and gums for fresh breath and a healthy smile. The cleansing system was really easy to use and Miley seemed to enjoy the gentle massage on her gums. I loved the peppermint scent which really did freshen up her breath! Hot spots are all too common in our Golden household. Summertime when they are swimming is usually when they appear and if not caught right away are a pain to deal with. This Hot Spot Oil contains two ingredients: Organic Golden Jojoba Oil and Organic Calendula Petals. Directions: Apply directly to irritated skin. Rub gently and massage into skin. Although I haven't had to use this product yet, I am really impressed with the quality ingredients and what's not in the oil. Vegan, Chemical-Free, Paraben-Free, Gluten-Free and Fragrance-Free. No synthetic dyes or perfumes, no preservatives or additives. Pure Natural Pets is dedicated to delivering the highest quality pet products using only the best materials the earth has to offer. They pride themselves on "Making Happier and Healthier pets, for a Happier and Healthier You." If you'd like to learn more about Pure Naturals Pet you can visit their website, all products are available to purchase on Amazon.com . Ends 5/5/16. Open to US residents only, 18+. Disclosure: *Pura Naturals Pet sent us the Ear/Teeth Cleansing System and Hot Spot Oil for review purposes. We were not compensated for this review and all opinions expressed are our own. 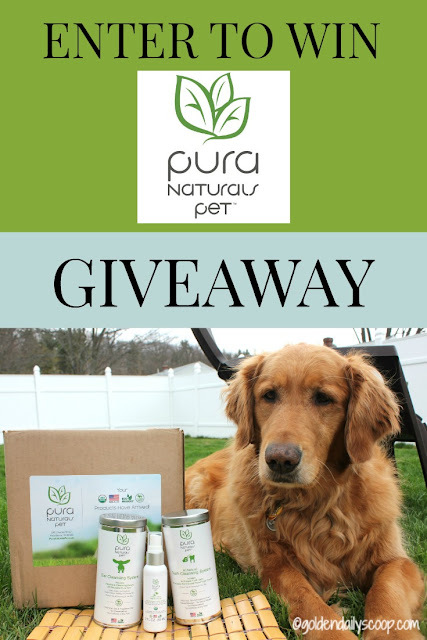 Pura Naturals Pet is not responsible for the content of this post. *Golden Daily Scoop is a member of the Amazon LLC Associates Program. This means if you cling on a link for a product on Amazon.com and make a purchase, we may earn compensation. I love this idea! Nola and I both have very sensitive skin (as in, free and clear everything, no lotions/perfumes, ect, or it's rash central), so I'm curious about these! I love that their products are non-toxic and safe! I like that they are Vegan, Chemical-Free, Paraben-Free, Gluten-Free and Fragrance-Free. No synthetic dyes or perfumes, no preservatives or additives. I like that they are USDA certified and free from all toxins! 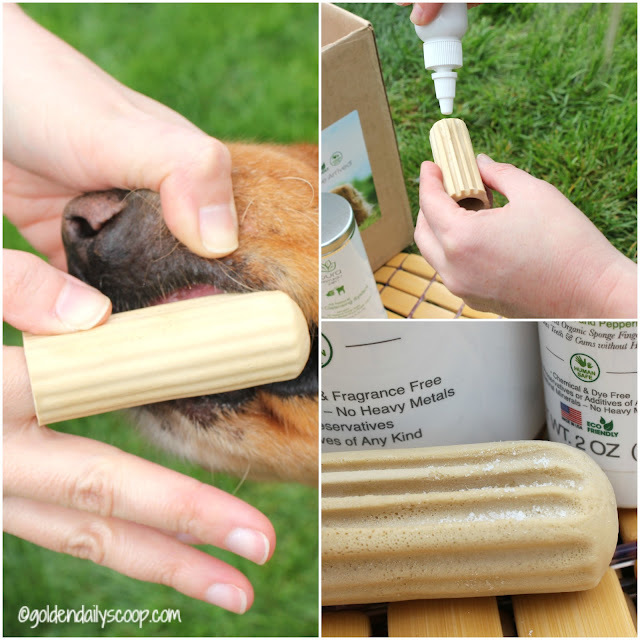 I love natural and organic products for the dogs. This teeth cleaning system looks great. I like that they are chemical free. I love my furbabies and want to keep them healthy and happy. Mr. N has a flea allergy and he scratches at himself almost raw so I have to watch him. I wonder if the hot spot oil would help! Hi Tanacious Little Terrier, our Hot Spot oil will definitely help relieve the itching as well as soothe the raw area. If you do try this product we would love to hear your thoughts! This brand looks great and the products very interesting. The dental cleaner looks great! I think our dog would like these products. I like that they seem like a safer alternative. My business partner's dog has ear issues and love the look of the teeth cleaning. Great to see all the natural healthy products launching. WOOT! Love all these products! I am definitely going to have to try the hot spot oil! I have one dog that consistently has them in the summer months and this would be perfect! I really like the product are of more natural kind which I think is more beneficial for my dogs. Those look like great products! I'm always on the lookout for new grooming/skin stuff for the girls! Thanks for the great post/giveaway! I love that it is all natural and chemical free. I don't like my ears to be cleaned but sometimes it is necessary! These sound like good products to help keep your dog healthy. I'm glad they are working out well for you! I'm all about finding natural products for my pets (& me). I really like this tooth cleaning product, cleaning pets' teeth is never easy! Thanks for sharing. This sounds ideal! I think it is really important to use natural products whenever possible. I like that htey are all natural! I like that there aren't any synthetic dyes or perfumes. I have a dog with a skin condition that this might help with, but those ingredients wouldn't help his problem. Thanks! I love the new technique with the specially made pura-finger n that the cleaner for the teeth is peppermint, also like that the hotspot product is made of awsome oils. I would definitely love to win this for Blue..
We are always looking for all natural, non-toxic products and that teeth cleaning system sounds fabulous! One of my dogs is prone to seasonal hot spots so I'm thrilled to hear about the hot spot oil as I would much prefer to treat Simon with a natural product than the prescription cream. I love hearing about new all-natural pet products. I wonder if their stuff is safe for cats too? One of my cats has ear issues, so I am always looking for a good cleaner for her ears! Sounds like some great new products. I need to try to develop a daily oral hygiene ritual with the girls. I'm super excited to hear about their ear cleaning system with organic herbs! Ear health is very important to me and my readers since improper ear care can lead to deafness. I am excited about the hot spot oil, it seems like every year Dakota get a hot spot. I love that these products are made in the USA and are non-toxic. I like that the products are nontoxic. I love natural products. I'm intrigued by the dental cleaning option which looks easy to use, which is especially helpful for one of our pups who dislikes brushing! Gosh, I hope they're coming to Australia... *crosses paws*. I love the look of the dental system AND the Hot Spot oil. Am heading to their website now, thanks! I really like that they're natural. I'm extremely picky about what I put in and use on my body, so why shouldn't I be just as picky with my dog! I love that Pura Natural Pets uses no harsh chemicals or irritants. This sounds just like what we need at our house! We have 3 with sensitive skin and allergies so natural & gentle products are what we look for. I like that it has · Certified to USDA Organic ingredients. Would love to try it. Mom loves hearing about natural products that are good for pets and the environment. She, too, like Kitty Cat Chronicles, is wondering if the ear cleaner is good for cats. Ocean could sure use some!